Work Done by Rotational Force Fields published in J. Opt. 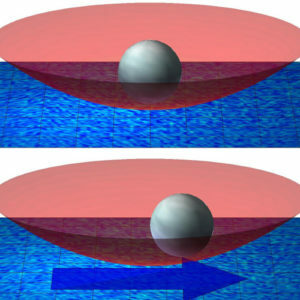 For a Brownian system the evolution of thermodynamic quantities is a stochastic process, in particular the work performed on a driven colloidal particle held in an optical trap, changes for each realization of the experimental manipulation, even though the manipulation protocol remains unchanged. Nevertheless, the work distribution is governed by established laws. Here, we show how the measurement of the work distribution is influenced by the presence of rotational, i.e. nonconservative, radiation forces. Experiments on particles of different materials show that the rotational radiation forces, and therefore their effect on the work distributions, increase with the particle’s refractive index.